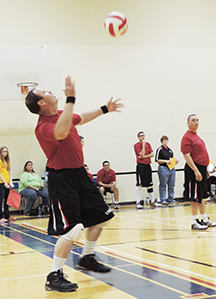 The game of volleyball is attractive to all ability levels, from competitive to developmental, young and old. To play volleyball players need to acquire basic skills, learn the rules and find a fun place to practice – from the beach to the gym. Each year, the Iowa State University Kinesiology and Health Club and the Iowa State University PE Clubs provide leadership and student volunteers, helping to make the state volleyball competition a success. Time: Opening Ceremonies begin at 9:00 a.m., First round games begin at 9:30 a.m.